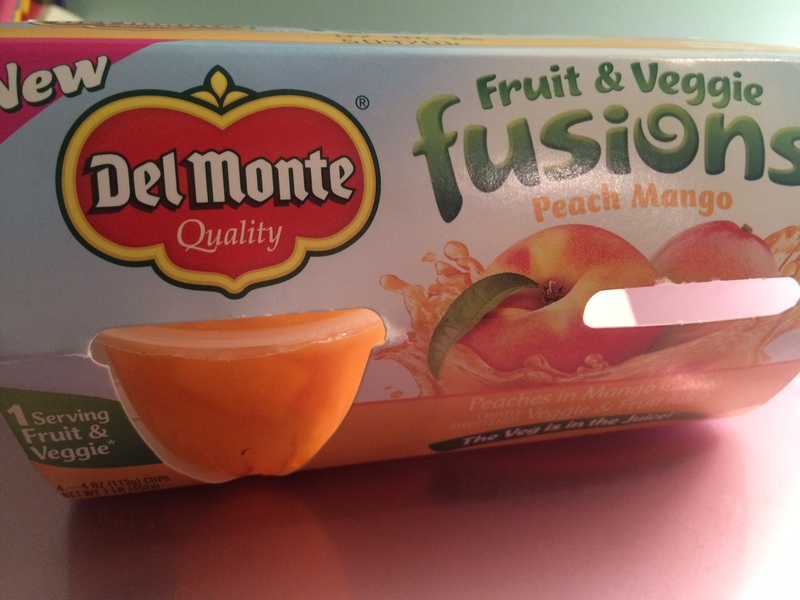 Del Monte has come out with Fruit & Veggie Fusions! They are blends of fruits with vegetables in the juice part of the fruit cup. They come in 3 flavors, Peach Mango, Cherry Fruit Trio, and Apple Pear Watermelon. Each cup combined in 1 serving of fruit and veggies, has NO HFCS, and contains a good amount of Vitamin C.
Del Monte sent me the Peach Mango one to try out. I happen to be a fan of both of those fruits. Mango I tread lightly with, NONE ripe mango I find super tart, but ripened mango is soooo delicious! This one in particular has California peaches, with pumpkin, sweet potato and butternut squash in the juice/syrup part! This is all coupled with some mango flavor as well. The verdict…pretty good! My mom adored these. She asked for a second one. I happened to like these too! When cold, they were super refreshing. 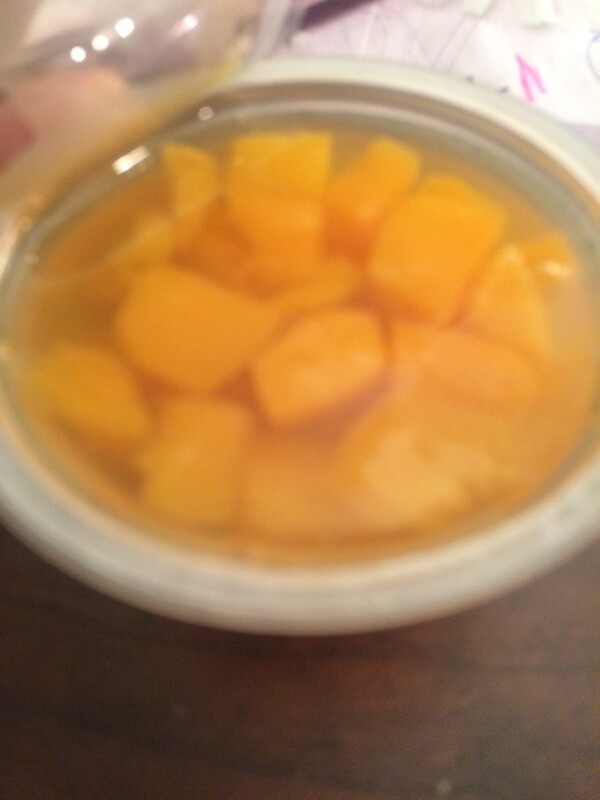 The mango flavor provided a bit of tartness, and the peaches provided some sweetness. The peaches were nice and soft, but not mushy, which is key. The syrup was somewhere between a juice and thicker syrup, but not super sugary-sweet. There is a bit of added sugar to these cups, but they are lightly sweetened. You cannot taste the veggies at all! This is great news for Moms with kids who hate veggies! Or great news for anyone, because when is it a bad thing to get extra vegetables in the diet? I think it was super smart to use the mild veggies like butternut squash and pumpkin, which already provide a tad bit of sweetness. 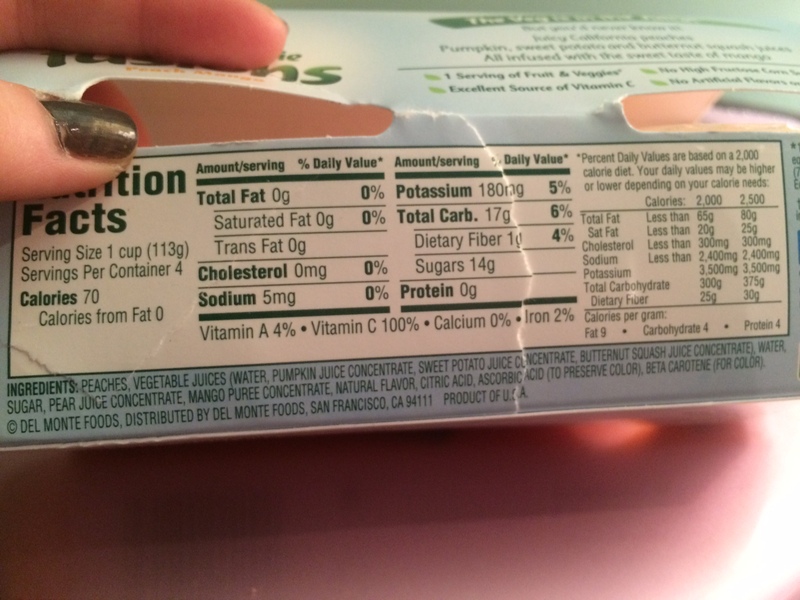 And, here’s the stats: I ripped it :/ ….I was too darn excited to try a cup! Due to the added sugar, I will have to give this 4 stars. But really good! I really want to try the cherry one…sounds yummy!